Opioids are pain relievers commonly known as OxyCotin, Vicodin, codeine, morphine, fentanyl, etc. (1). In general, prescription opioids are safe to use when used as prescribed, but have highly addictive qualities. They create that happy feeling of euphoria similar to the endorphin release after a great workout. Heroin is in the same drug classification category as prescription opioids and pain relievers. Prescription opioids and heroin have similar effects on the body and bind to the same receptors in the brain. An increase in opioid use, misuse, and overdose has surged over the last few years. 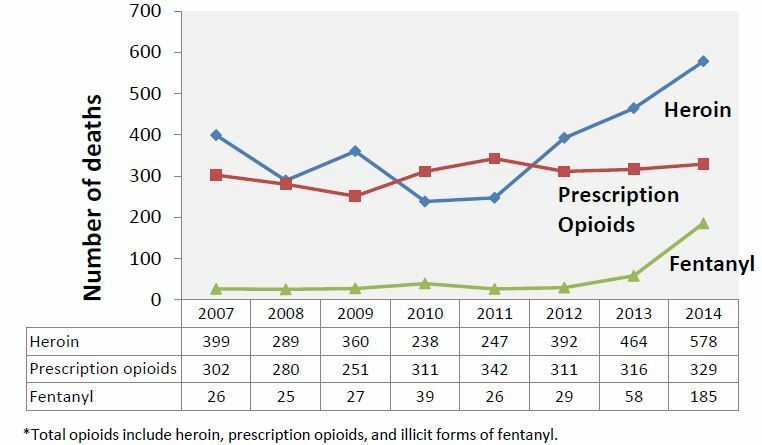 Carson et al., (2015) found that the main factor in predicting heroin use is previous misuse of prescription pain medications. Number of Opioid-Related Deaths Occurring in Maryland by Substance, 2007-2014. 85.7% of all intoxication deaths that occurred in Maryland in 2014 were opioid-based; these included deaths related to heroin, prescription opioids, and non-pharmaceutical fentanyl. Prescription opioids and heroin have the same possible effects on your body. There is an immediate sense of euphoria, pain relief, nausea, slowed breathing—as well as confusion, drowsiness, and the possibility of death (2). There are long-term harmful effects on the body that can attack all systems, hindering daily function and resulting in addiction. With prescription opioids, older adults are at higher risk then other populations for severe drug interactions and the breakdown of the medication in the body. Heroin users will often experience the long-term effects of the drug through constipation, insomnia, stomach cramps, liver or kidney disease, and pneumonia (2). Prescription opioids in pill form are often crushed to snort or inject to quicken the onset (3). The opioid prescription pain medication becomes too expensive for users to buy, so they switch to cheaper versions and heroin to reach that feeling of jubilation. Mandell et, al. (1994) reported that those users sharing needles were often younger and typically required borrowing needles with instruction for their first time use. Heroin can be taken into the body in many ways, but the most common is through injection (Church et al., 2010). Toxic contaminants are often present in street heroin that clog blood vessels leading to the lungs, liver, kidneys and brain, and can even cause arthritis problems (3). Continual, long-term use of needles will cause “scarring and/or collapsed veins, bacterial infections of the blood vessels and heart valves, abscessed (boils), and other soft tissue infections” (2). Injection provides an immediate gateway to an individual’s blood, making the user susceptible to disease and bacteria. By sharing needles, users increase their risk of contracting HIV, hepatitis, and other infectious diseases (4). Church D, Barton K, Elson F, DeMaria A, et al. Notes from the field: risk factors for hepatitis C virus infections among young adults – Massachusetts, 2010. Morbidity and Mortality Weekly Report (MMWR). Atlanta, GA: Centers for Disease Control and Prevention; 2011.